Santa Claus stopped by the Southern Illinois University Edwardsville’s Goshen Lounge Thursday, Dec. 6 to hear Christmas wishes, bring holiday cheer, and take selfies with students, faculty and staff. 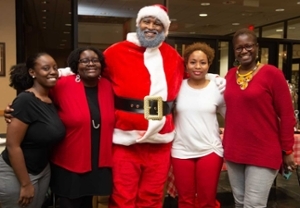 The SIUE Black Faculty and Staff Association (BFSA) hosted Santa’s visit. 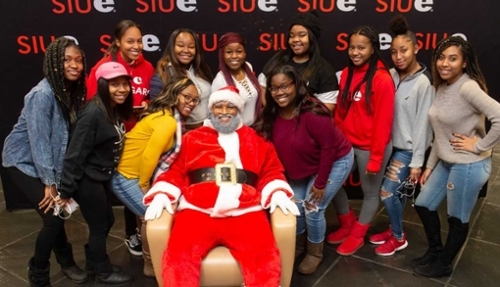 SIUE’s personal contact with the North Pole was Dominic Dorsey II, director of Accessible Campus Community and Equitable Student Support (ACCESS). “I want a black dump truck,” 4-year-old Charles Johnson told Santa. Charles is the son of junior Tyrone Johnson, who is majoring in exercise science. 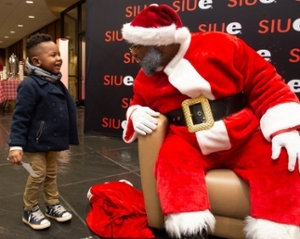 Four-year-old Charles Johnson, son of SIUE junior Tyrone Johnson, talks to Santa. Greeting Santa are (L-R) Tarsha Moore, assistant director of the Center for Student Diversity and Inclusion; Jessica Harris, PhD, interim assistant provost; BFSA President Lakesha Butler, Pharm D, and clinical professor in the School of Pharmacy; and Kathryn Bentley, director of the Black Studies program and associate professor in the Department of Theater and Dance. 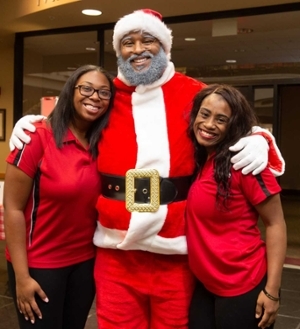 With Santa are graduate students from the Kimmel Student Involvement Center (L-R) Kimberly Pope and LaShata’ Grayson. Females of African-American Descent Modeling Excellence (FAME) pose with Santa.